Sukkot starts tonight and I’m excited to be meeting a few friends for dinner in one of the many temporary buildings that have popped up in parking lots all over the city. I wrote another piece about my time in Sicily for the Forward. 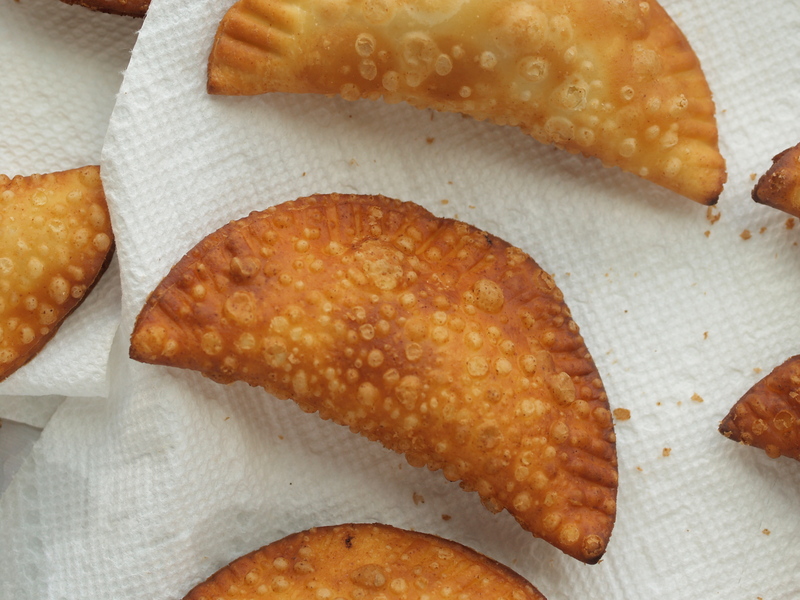 I’ve pasted it below along with a recipe for casatelle – ricotta-filled turnovers that I fried up a few weeks ago. Living in an apartment 20 stories above the streets of Manhattan can make relating to the holiday of Sukkot and its harvest celebration somewhat difficult. But spending time this summer in Sicily, an island with a dramatic and rich agricultural heritage, re-acquainted me with the agrarian setting in which so many of our holidays originated. During my week at the Anna Tasca Lanza cooking school, we picked lettuces for our salad, drank wine from the vineyard just up the street and ate ricotta from neighboring sheep. One morning, awakened by cooing birds outside my window, I spent a pre-breakfast hour writing in a small pavilion situated in the edible garden just a few stairs from my room. Surrounded on three sides by blue and white striped canvas walls, I scribbled away. As my stomach signaled time to eat, lazy plops of rain hit the bamboo roof. I took it all in — the temporary shelter, the vegetation, the gentle scent of fertilizer — and felt a sense of being tied to the land and at the mercy of the weather. I left my sukkah and ran to the kitchen for coffee. Our final cooking lesson included cassatelle, fried turnovers filled with ricotta made by the shepherd we had visited earlier in the week. They reminded me of the Sukkot tradition of cooking stuffed foods to signify the abundance of the harvest. Back in my own kitchen, I prepare for the holiday by rolling out dough and wrapping it around soft blobs of cinnamon-scented cheese, frying up the pastries in sputtering oil and eating them warm with just a dusting of powdered sugar. As I lick my sweet fingers, I’m thankful for the abbondanza of my own life. Adapted from Fabrizia Lanza’s Coming Home to Sicily. 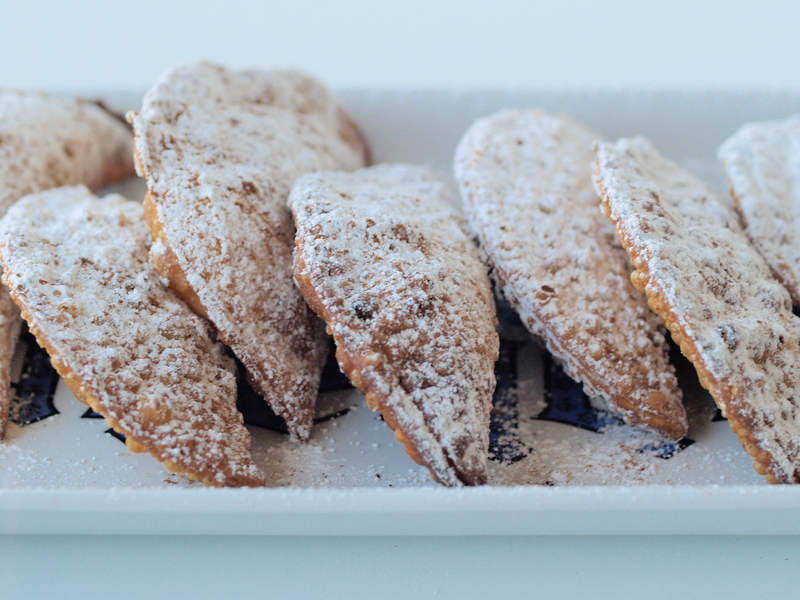 Cassatelle are ricotta-filled turnovers common in the eastern part of Sicily, and Mario, Executive Chef of the Anna Tasca Lanza cooking school, attributes their origins to Arab and Spanish flavors and techniques. The dough uses semolina flour and feels like fresh pasta. Wine in the dough provides both flavor (a bit of sweetness) and texture, helping with the formation of bubbles in the pasties as they fry; dry Marsala works well. The recipe calls for a pasta machine to help knead the dough and roll it out to a uniform thickness. Alternatively separate the dough into five pieces and roll each out into a 9-by-9 square before cutting out circles. These pastries are best fresh, but you can freeze the filled turnovers and then thaw and fry them up when you’re ready to eat. Warm. Combine the wine and oil in a small saucepan and heat until just warm (not hot). You can also use a microwave. Knead. Mound the flour on a work surface or in a very large bowl (the latter is my preference), and make a well in the center. Add the wine-oil mixture and salt to the well, and with a fork, carefully incorporate it into the flour. Knead the dough with your hands, adding drops of water until smooth and elastic, about 8–10 minutes. The dough should slowly spring back when you poke it with your finger. Rest. Roll the dough into a ball, wrap in plastic and rest for 30 minutes on the counter. Mix. In a small bowl, stir together the ricotta, granulated sugar and cinnamon. Set aside. Roll. Set a pasta machine to the widest setting. Run a piece of dough through the machine about 5 times at this setting, folding the dough in half each time before rolling it again. When the dough is very even, move the dial to the next setting and roll it through 2 to 3 times more, folding it each time. Move the dial to the third setting and roll it through 2 or 3 more times. Cut. Lay out the dough on a floured work surface, and cut out circles with a 4-inch round cookie cutter. Fill. 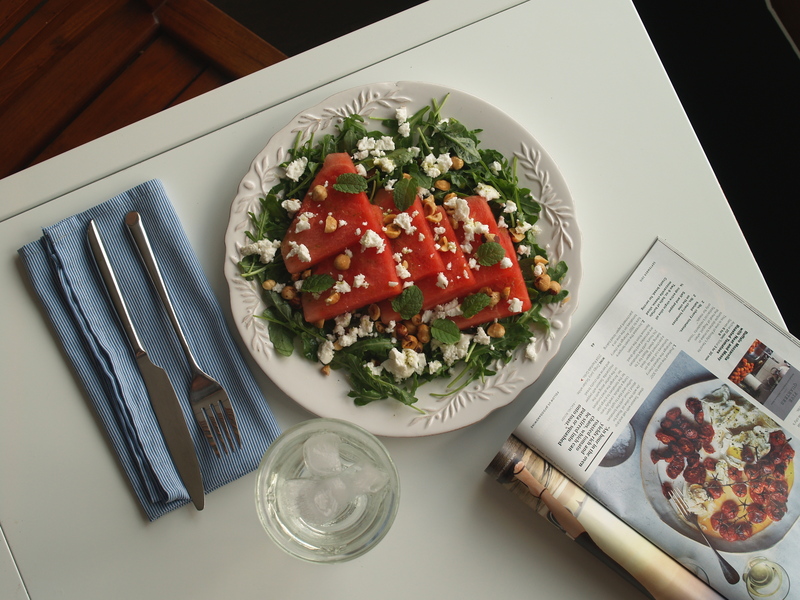 Place a spoonful of ricotta just off-center, then moisten the edges of the dough with water and fold over. Pinch or use a fork to seal. Repeat with remaining dough and filling. Fry. Heat 2 inches of oil in a large, heavy skillet or Dutch oven (higher sides will limit splattering). Drop in a scrap of dough — the oil is hot enough when the dough floats and oil rapidly bubbles around it. Add the cassatelle in batches and fry, flipping occasionally, until deep golden, about 3 minutes. With a slotted spoon or skimmer, transfer to paper towels to drain. Serve. Sprinkle with powdered sugar and cinnamon. Serve warm. The recipe I have for you today is a simple drop cookie. 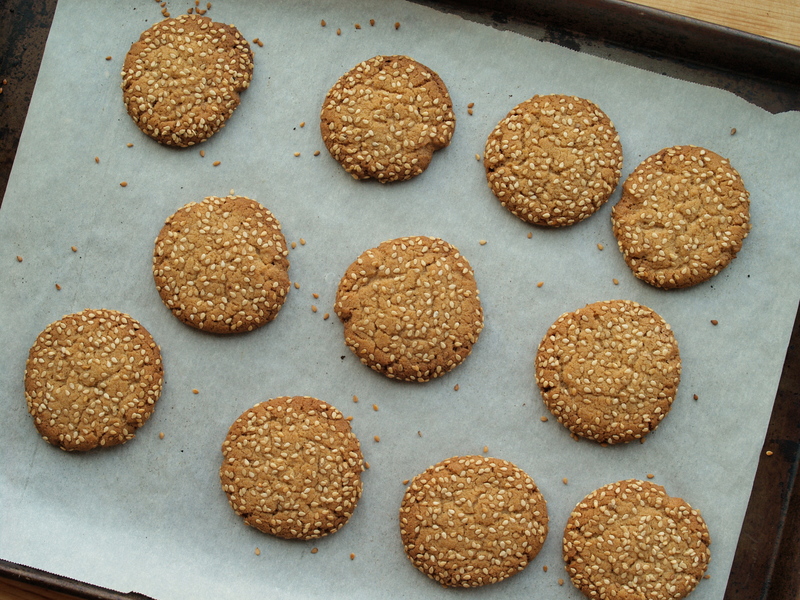 Sesame seeds are said to represent abundance for Rosh Hashanah, so I found a cookie recipe that is essentially peanut butter cookies with tehina swapped in. Then I coated the dough in seeds before baking. Out of the oven, the cookies are crunchy and a little crumbly, with a texture like French sable cookies. I brought them to Atlanta for the weekend and a few people have been asked for the recipe, so this one is for you, Caroline and the whole Katz family. Shana tova! Adapted from Martha Stewart. 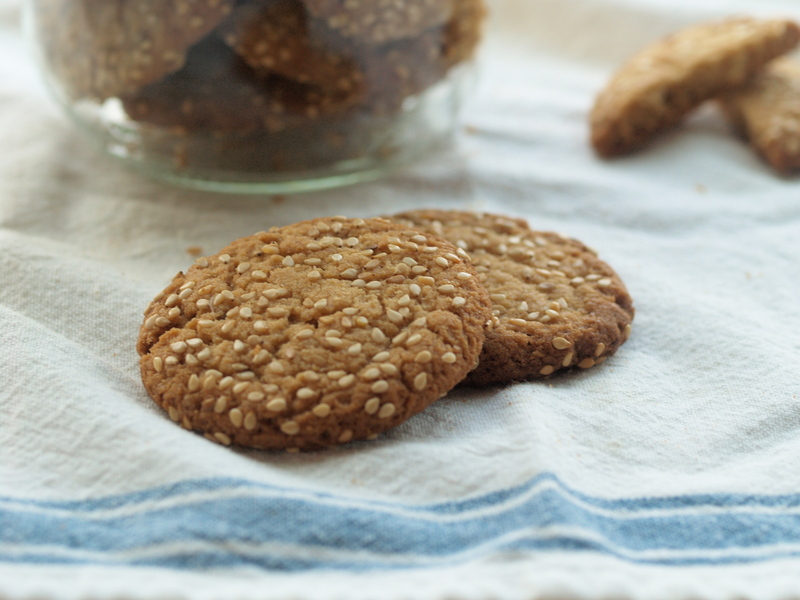 These are essentially peanut butter cookies with tehina instead of the peanut butter. If your tehina has separated, you might want to throw it in the microwave for 10 seconds at a time to soften the paste and facilitate stirring. If you don’t stir the tehina through, your cookie dough may be a bit oily. The baked cookies will taste good even if it’s a little bit more difficult to roll the dough into balls. Mix. In the bowl of an electric mixer fitted with the paddle attachment, cream butter, tehina, and both sugars together until light and fluffy. Add egg and vanilla, and mix on medium speed until well combined. In a medium mixing bowl, sift flour, baking soda, and salt together. Add to the butter mixture, and beat just to combine. Chill. Let the dough rest in the fridge for 30 minutes. Heat. Heat the oven to 350ºF. Roll. Scoop out 1 – 1 1/2 tablespoons of dough (I use a mini ice cream scooper), and shape into a ball. Roll in sesame seeds and place 3 inches apart on parchment-lined baking sheets. Bake. Bake one tray at at time until golden brown, 12 to 14 minutes. The cookies should still be a little bit soft in the middle, but will harden as they cool. Transfer baking sheets to a wire rack to cool. Store. Store in an airtight container at room temperature up to 1 week. I’ve promised to write more on my time in Sicily, a week at the Anna Tasca Lanza cooking school and a few more days at the beach in Cefalu. I’ve found so much inspiration in the course, the school, the landscape of the island that I’m writing a short series of articles for The Forward, tied to several Jewish holidays. Since so many of our holidays are tied to an agricultural calendar, it makes sense that spending time cooking directly from the land would provide a catalyst for recipes to celebrate. In this first piece (pasted below), I get my first taste of Sicily in the form of figs so ripe that every attempt to photograph them slumped into a puddle of juice. 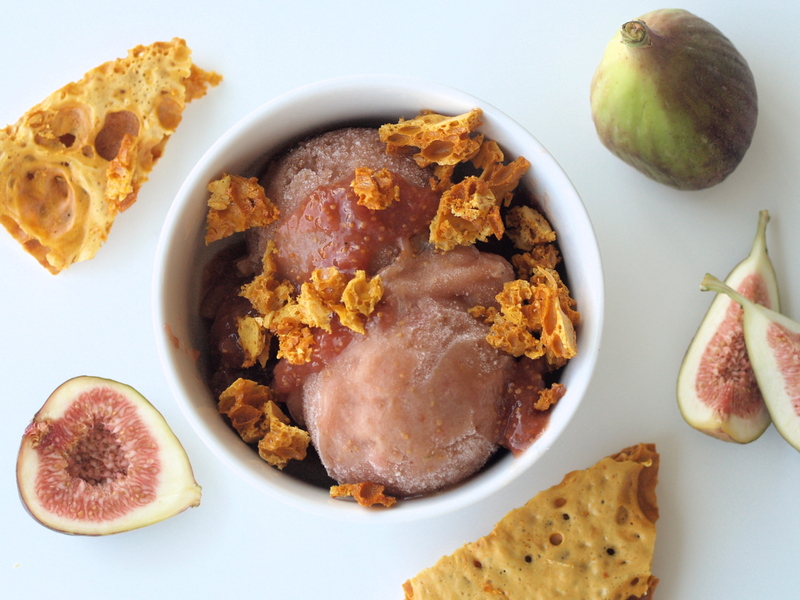 No worries, I drew the best out of grocery store figs to create a sorbet coupled with honeycomb candy, perfect for launching a new year of adventurous travel and delicious experiences. 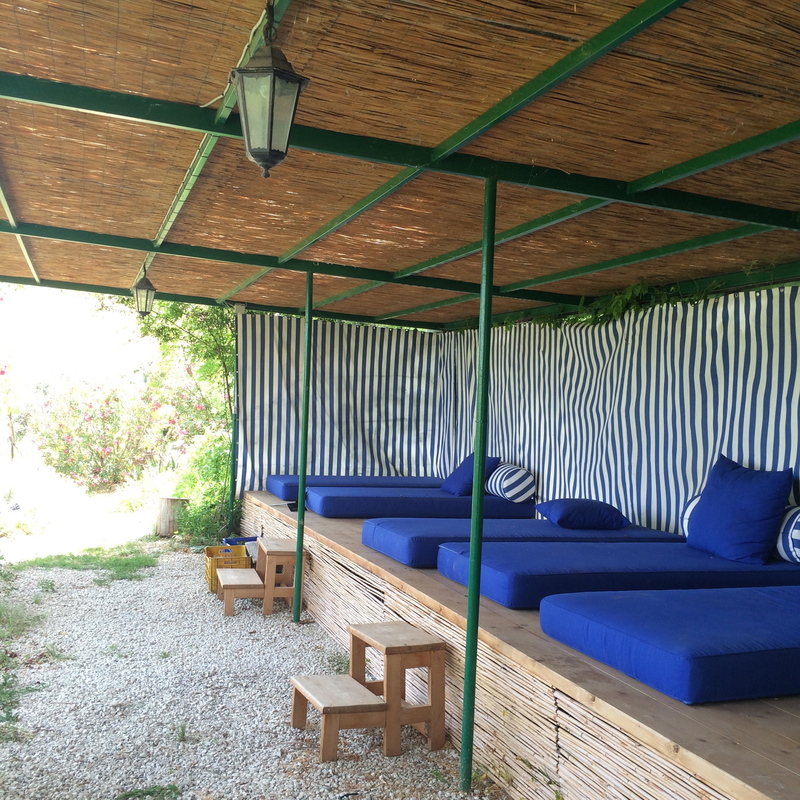 Until recently, what little I knew about Sicily came from Sophia Petrillo’s stories on “The Golden Girls.” Spending a week at the Anna Tasca Lanza cooking school last June, though, gave me a proper introduction to the rich landscape of this large island. I was there for a course on food writing and found myself smitten with Sicilian culinary heritage. This year I’ll be celebrating the Jewish holidays with an eye toward incorporating into my own traditions the foods I tasted in Sicily. Early on a Monday morning I flew to the island’s largest city, Palermo, and took a bus into town. There I met up with Susie, another student attending the workshop. We shook hands, awkwardly hugged, dropped our luggage in a storage room at the train station and set off to explore the city. With only a few hours before our connection, sightseeing options were limited, but no matter: Our only goal was gustatory. Susie navigated us to Mercato del Capo, the souk-like market that’s a testament to Sicily’s long-ago Arab rule. We stopped in front of the largest jar of Nutella I have ever seen, a beckoning hand dipping strawberries and offering them up. Our loyalty was easily bought. At the sight of a 10-euro banknote, the vendor filled a paper cone with berries and another with plums. I pointed to a pile of green fruits, shaped like Hershey’s kisses, each about the size of my fist. The vendor held one up — “ Fichi !” he said. “Figs,” Susie whispered — and ripped it open, swiping each half in the chocolate spread before handing them over. While we chewed, he piled figs into two more cones. “ Basta, basta !” Susie cried, holding up her hands like a crossing guard stopping cars. Our vendor indicated that he had no change for our bill and emptied a box of cherries into a final cone, making sure we got every last cent’s worth. After wandering the stalls, Susie and I plopped ourselves down in a shady spot. I fished out a fico and weighed it in my palm, its bottom felt heavy like a water balloon and I saw a few crystallized beads of sugar escaping from a small crack in the skin. I tore it open and lapped up the dripping flesh, feeling the seeds crackle between my teeth, and letting the sweet juice pool in the dust at my feet. Until that point, I had never actually enjoyed eating a fresh (or dried) fig. I found myself mumbling a shehecheyanu and explaining to Susie the Rosh Hashanah tradition of saying a blessing over a new fruit that you hadn’t eaten all year. We retrieved our luggage at the station and met a few more classmates on the bumpy train. Mario, one of the chefs, picked us up in the small town of Vallelunga and drove us to the school where, after washing off the travel, we launched right in to what would become an evening tradition: aperitivo hour in the courtyard outside the kitchen. Next to a tray of bubbles in stems and several plates of bruschetta, Susie laid out the remains of our market fruit picnic. Over this abbondanza of food and drink and against the setting sun, we introduced ourselves. Against this backdrop, I was ready to begin. As I prepare for the New Year, I wanted to re-create that first taste of fruit in the heat of the Sicilian sun by making a refreshing sorbet. This recipe is inspired by the decadent fresh figs I ate in Sicily this summer and is adapted from sorbetto di fichi in Fabrizia Lanza’s Coming Home to Sicily. I used green Calimyrna figs, but black ones will do just fine as well. The step of peeling the figs is important – my first batch I included the peels and the texture was strangely slimy. At the Anna Tasca Lanza cooking school they serve the base sorbet recipe with freshly whipped cream. For Rosh Hashanah, I wanted to add in some honey elements. The fig and honey swirl provides some textural contrast, as it is thicker than the sorbet itself, like a ribbon of fudge in a decadent chocolate gelato. 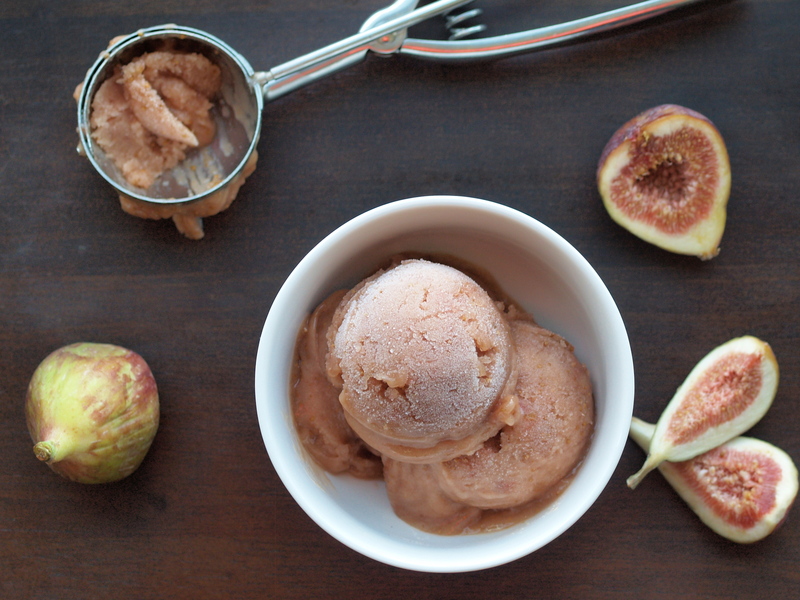 You’ll need a scant three pounds of figs total if you’re going to make the sorbet and the swirl. 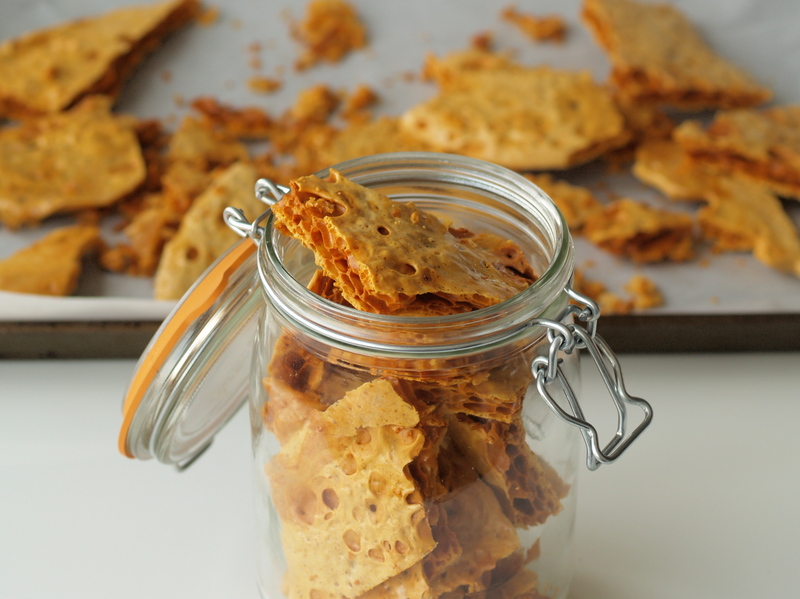 For a nice crunch, crumble the honeycomb candy over top. Peel. Slice the stem off the figs. Peel by sliding the tip of a knife under the top layer of skin and grasping it with your thumb, pulling towards the opposite end in long strips. You’ll be left with a thin layer of white pith around the pink flesh. 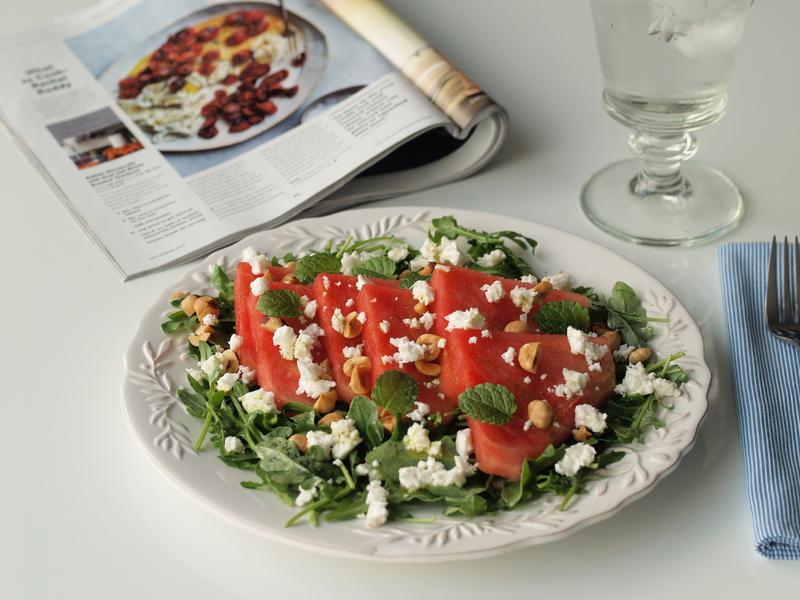 You’ll end up with 1½ pounds or about 3 cups of peeled figs. Puree. In a blender, puree the peeled figs, port and/or water, lemon juice and sugar until very smooth. Chill. Cool in refrigerator for 2–3 hours. Freeze. Freeze the cold mixture in an ice cream maker. 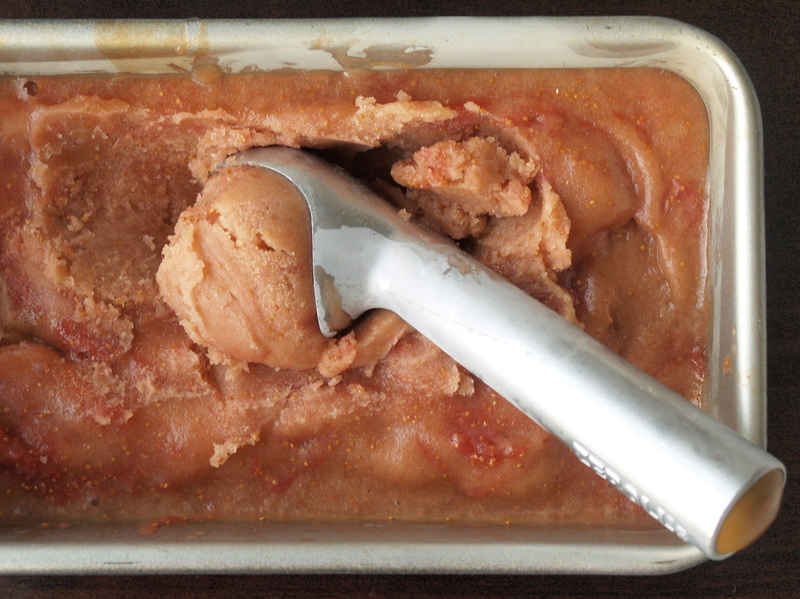 Once the sorbet has finished churning, dribble in the cooled fig and honey swirl and gently stir to distribute it but not so much that it disappears. Transfer to an airtight container and put in the freezer to firm up for a few hours or overnight. Serve. Scoop into bowls and sprinkle with crumbled honeycomb candy. This fig and honey compote is also great over vanilla gelato or mixed into your morning yogurt. Heat. Over a low flame, heat the figs and honey for approximately 10 minutes until the figs break down into a thick syrup. Pulse with an immersion blender until only small pieces of fig remain. Cool in refrigerator for 2–3 hours. This candy is adapted from a recipe that the pastry chef at Marta gave me. You do need a candy thermometer. This is an edible version of the volcano experiment: Baking soda (a base) reacts with hot honey (acidic) to form carbon dioxide bubbles that get trapped in the candy as it cools and hardens. But please be careful: Hot sugar can burn, so don’t let kids get too close. In the restaurant, we crumble honeycomb candy over vanilla gelato drizzled with extra-virgin olive oil in a twist on affogato. This candy is also known as seafoam, hokeypokey, and, when coated in chocolate (I prefer dark), is similar to Australian Violet Crumble. It’s fun to have a jar of it in the kitchen for sweet honey snacking over the Rosh Hashanah holiday. Prep. Line a half sheet pan (18” X 13”) with parchment paper. Sift the baking soda into a small bowl. If you don’t sift, you might happen upon a nubbin or two of unpleasant tasting baking soda in the middle of your candy. Heat. In a large pot (the mixture will expand about four-fold, so make sure your pot is big enough!) over medium heat, mix the sugar, honey and water. Clip a candy thermometer to the pot. Over the span of about 5–7 minutes, the syrup will bubble gently and then darken to a golden brown at around 290° F. Stand over the pot because the last stage goes quickly and you don’t want burnt sugar. Pour. Once the syrup hits 300° F, pull out the thermometer and pour in the sifted baking soda. Stir 2–3 times with a rubber spatula (not too much or you’ll deflate the mix) and the syrup will lighten, turn opaque and quadruple in size. Carefully tip the bubbling mess onto the lined sheet pan — it will look like a big blobby monster crawling out of the pot. Let it spread out on its own and resist the urge to touch it — it’s hot and can burn and also too much fussing will break the bubbles. Store. When completely cool, break into pieces and store in an airtight container.